To get the inside track on the 1960 Portuguese Grand Prix, one needs to know a little about John Surtees. He was raised around motorcycles as his father had been a sidecar champion. His mother, before the Second World War, had been a passenger in some of his father’s sidecar races. In 1949, the fifteen-year-old Surtees entered his first motorcycle race. Quickly hooked, he acquired an apprentice with Victory motorcycles the next year. A couple years later, he saved enough to buy a competitive Norton for 280 pounds. Beginning with the 1953 Isle of Man TT, Surtees’ hardly looked back while racing his way to meteoric success. By the mid-1950’s, John Surtees approached Norton about a factory ride. They believed he would have success; however, the board of directors was unable to give him a factory ride for financial reasons. In short, the troubled manufacturer did not have the funds to race at the highest level. Nevertheless, he made himself known and the Italian firms took notice. 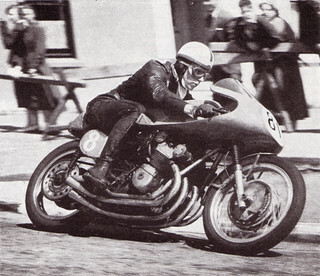 For the 1956 season, Surtees raced for MV Agusta. He won the world championship that year. He did it again in 1958 and 1959. In fact, he was on his way to winning the motorcycle championship this year—1960. However, apparently, one discipline was not enough to satisfy his desire to be ultimately quickest. With one foot still on the peg of motorcycle racing, he put his other foot into open wheel racing in 1960. Having convinced Colin Chapman to give him a ride with Lotus, he impressed early on. His first grand prix was at the already legendary Monaco circuit. After that, he returned to his motorcycle commitments and missed the next three Formula 1 grands prix. Amazingly, when he returned at the 1960 British Grand Prix, he took second place in only his second open wheel grand prix at Silverstone. This brings us up to his third race. Having only a few hours of GP racing under his belt, Surtees’ threw down with crushing speed at the Porto street circuit. By the end of practice, it was clear that Surtees had a gift for speed. With a time of 2:25.56 around the 4½ mile circuit, John took pole with a lap record. Up and coming American Dan Gurney and Australian Jack Brabham shared the front row. On race day, one can only imagine Surtees’ trying to quiet the trepidation as the world’s best open-wheel drivers roared their engines behind him. When the flag dropped, the ground shook, and Surtees took off. John proved his qualifying time was not a fluke. He raced ahead and led the entire first half of the race. But today would not be his day. As impeccably described by Eoin Young, in his book McLaren Memories, “but then the Lotus’ fuel tank split and Surtees’ soaked right boot slipped off the break pedal and he slammed into a kerb.” This was enough to damage the radiator and force Surtees’ retirement. There was no doubt that his performance had, nevertheless, been noticed by the bigger figures. The podium ended up being a who’s who of this era’s up and coming stars: (1) Jack Brabham; (2) Bruce McLaren; and (3) Jim Clark. Having added eight more points to his total, in a string of wins that began the Dutch Grand Prix, Jack Brabham had, in effect, clinched the 1960 World Championship with both Monza and the United States Grand Prix remaining. This occurred for two reasons. First, the British teams refused to race at Monza for political reasons. Second, the only person that could challenge Jack Brabham was his teammate, Bruce McLaren. In those days, McLaren was unlikely to make a move to beat out the teams number one. This entry was posted in Uncategorized and tagged 1953 Isle of Man TT, 1960 Portuguese Grand Prix, Bruce McLaren, Eoin Young, Jack Brabham, John Surtees, McLaren. Bookmark the permalink. ← The 1960 British GP + How to Lose With Style.